I am so thrilled to announce that our sixth installment of the Harry Potter unit studies is finished and ready to purchase! Half-Blood Prince happens to be one of my favorites in the series, mainly because I love getting backstory and this novel is chock-full of it! Harry is back at Hogwarts for his sixth year and it wouldn’t be Hogwarts without new and impending danger lurking around every corner. Voldemort is back and building his army of Death Eaters, someone at Hogwarts is cursing and poisoning people and Harry is sure that it is Draco Malfoy up to no good and following in his father’s footsteps. Meanwhile, Dumbledore is preparing Harry for war by showing him Tom Riddle really was and how he became Lord Voldemort. There could be a secret to defeating him for good if they can only figure it out. In this unit, like the units preceding it, you’ll continue your Magical Terms and Spells Glossary, Magical Devices Guide, Magical Creatures Field Guide, Travel Guide to the Wizarding World (Magical Places), and the Weekly Prophet. As always, there are copywork/dictation passages taken from the novel, as well as vocabulary, discussion questions, and activities to help you get the most out of the story. You will also be studying a Hogwarts course – this time it’s Potions! Or in Muggle terms, a study of the Periodic Table of Elements. We’ll be reading How to Make a Universe With 92 Ingredients and Ingeniously Daring Chemistry to dig deep into a study of the Elements that make up the world (and universe) around us as well as learning about some of the scientists who helped to discover them. 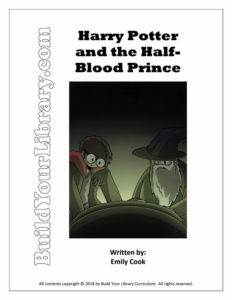 The Harry Potter and the Half-Blood Prince unit study will take approximately 3 weeks to complete and is appropriate for upper-elementary and up. The PDF file is 54 pages and includes a full schedule, project ideas and 15 activity pages. ** Our PayPal e-Junkie powered shopping cart will process your order. All our digital programs are in PDF form. They cannot be returned or refunded. Once you place your order, you will receive a download link to your items. As a reminder, if you are going to purchase books we would greatly appreciate the use of our provided Amazon Links in the unit study PDF! Thanks! Do we have to start with the Sorcerer’s Stone unit study, or can we jump in at any of the books? Yes and no. While these unit studies are semi-standalone if they had to be, they are designed to be completed in the order that the book series ran. Like the storyline in the books, the unit studies continue to build off of each other as they progress. You will start several activities such as keeping a glossary of magical terms and spells or creating a field guide of magical devices, to name a few. These will be used through the unit study series and new activities and additional entries will be completed in subsequent lesson plan. If we already read the book, do we have to read it again to complete the unit study? The unit study is designed to enhance the reading (or re-reading) of the book. While you are going through the chapters, vocabulary words are pulled out and activities are performed that correlate with what you are reading. This is the perfect unit to complete on your first reading of the book, as well as a perfect companion for reading the book again and diving deeper into the lore and story. Are you planning on writing unit studies for all of the Harry Potter books?